France Says Russia & China Didn't Want Syria Briefing But "Obliged to Accept"
UNITED NATIONS, December 9 -- The day after France was accused by several other UN Security Council members of "grandstanding" on Syria, Inner City Press asked French Ambassador Gerard Araud on his way into the Council if they thought there will be a procedural vote, as Araud had requested or threatened, about scheduling a briefing on Syria by High Commissioner on Human Rights Navi Pillay. After Araud requested the briefing and threatened the procedural vote on Thursday, Russian Ambassador Vitaly Churkin came out and told Inner City Press that "before anything happened they spread the rumor that Russia and China were against, and they start writing that Russia and China are against it. We almost had a deal on how to do it. The usual culprits were as usual all confused about things." "No, I don't think, actually, because by asking for a procedural vote, everybody had to reveal its position, so the opponents saw they were in the minority so they will be obliged to accept, that was the whole of what I've tried. Of course we were not going to a procedural vote. But it meant that Russia and China who didn't want to hear Mrs. Pillay have been obliged to discover they were ready to accept it. So we will have Mrs. Pillay. I am sure that today they will say they accept to have it but in consultations." Consultations are closed to the press and public. Inner City Press asked, so you mean a closed briefing? 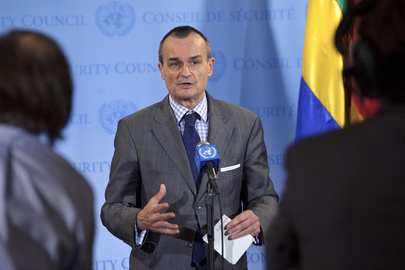 Previously, after French foreign minister Alain Juppe said he had charged Araud with pushing for consultations in the Security Council about France's proposal of humanitarian corridors in Syria, Churkin told Inner City Press that Araud in his bilateral meeting with Churkin as December's Council president had not even mentioned Syria. While the Pillay briefing may well now take place, some wonder if pre-picking fights and gloating about winning a fight that, according to Churkin, was illusory or misrepresented is the best way to actually seek Council action on Syria, or is simply... grandstanding, as several Council members put it on Thursday. We'll see -- watch this site.